By supporting others and promoting change, helping professionals can also enjoy the benefit of personal growth. Changing People's Lives While Transforming Your Own is filled with narratives from individuals from social work, psychology, counseling, and allied health fields. 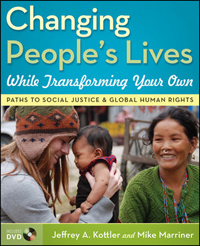 Inspiring and stirring, this book vividly illustrates how to promote social justice and foster global human rights. Its accompanying DVD features stories from a social justice mission to Nepal reaching out to neglected children. Students and professionals will find this book a profound reminder of how targeted social justice efforts have resulted in transformative experiences.